When I was coming up through the ranks in competitive target shooting, the .38 Special in a souped-up double-action revolver was the norm. High sights, a bull barrel and a holster that looked like it came out of "Star Wars" were the equipment of the day, and, yes, this combo actually brought home some trophies for me. Then one day I was invited to see an IPSC match, and that sold me on the .45 semiautomatic handgun. The thought of running a course- as opposed to a static position on the firing line- complete with reloading while moving with targets at various ranges brought a new dimension to my shooting experience. I still shoot matches here and there today, and my preference is the 1911, so when Ruger came out with a target version of its SR1911, I had to give it a try. First off, the SR1911 Target features a Bo-Mar style adjustable rear sight that is milled into the slide via a dovetail and includes wide slotted screw heads for positive adjustments. The rear blade measures a hefty .870 inch across by .440 inch high. The rear sight is serrated, and the beavertail safety sports a memory bump for sure operation. This is the only gun in Ruger's standard 1911 lineup to incorporate G10 grips. The rear of the blade is serrated to keep reflections at bay and is rounded off so it won't snag on the holster. The notch is wide and deep and in concert with the front blade offers the shooter a great sight picture. There are no white outlines or colored dots on the front or rear the sight. The slide is stainless, finished in a satin luster and machined to CNC precision. Cocking serrations are at the rear of the slide only, and the Ruger logo is etched on both sides of the slide- as is "Made in USA" (1911s are produced at the company's Prescott, Arizona, facility). The ejection port has been enlarged, and inside you'll find a hefty extractor teamed with a mechanical ejector, and both performed flawlessly during my testing. Ruger machines the barrel and bushing from the same stainless steel bar stock, which contributes to accuracy. The frame is cast, a process Ruger perfected long ago. Both the stainless steel five-inch barrel and the barrel bushing are made from the same bar stock, a process the company says enhances accuracy potential. The barrel is slightly flared toward the muzzle, just a few thousandths of an inch, for a better fit with the bushing, and the feed ramp and chamber are polished for additional reliability. When the gun is closed, there is a small open notch at the tail end of the barrel acting as a visual sighting tool for checking the chamber for a loaded round. Inside, the gun incorporates the standard Browning-designed recoil spring, spring guide and plug. The frame is cast from 415 stainless and has a slightly different color than the slide; it's more neutral whereas the machined slide has a slight tinge of blue to it. There is a finger recess on each side of the skeletonized trigger, which has an overtravel adjustment and broke at 4.25 pounds every time. Being a target gun, the trigger has the feel of a two-stage competition setup: Pull the trigger back slightly until you feel some resistance, then a bit harder to allow the sear to release. Back in the day, competitive shooters would've killed to have ambidextrous thumb safety levers come stock like they do on the new Target. The magazine release has been extended outward, and the magazine well has been tapered on the inside edges for faster reloads. The beavertail safety is large and comes complete with a hammer well to allow the skeletonized hammer more room while allowing the safety to ride higher in the hand. The flat mainspring housing is checkered for additional support while shooting. In years past, competitive shooters would die for ambidextrous safety levers on a gun, especially when it came to that part of the match where you had to use your weak hand. The Target has them as standard equipment; they are oversized, serrated and smooth-operating and black in color, as is the slide stop. The gun comes equipped with a pair of black laminated G10 grips with the Ruger logo, complete with some tasteful checkering and a satin finish. The gun shot good groups at 25 yards, especially considering it is not "tuned" to any great extent (a process that would certainly add to the cost). With average groups falling into neat three-inch clusters, the best group of the day was with the Winchesterâ€”five shots into 2.25 inches. I brought along a bunch of .45 ACP handloads that were starting to clutter up the shelves in my gunroom- different loadings complete with a variety of bullets in all shapes, weights and velocities. To my delight, the Ruger had no problems with any of them, which made me a happy shooter. It never balked or flinched and threw empties far to my right for later collection. Considering all the calibers and variations, today's shooters might have a hard time picking out a competition gun- especially if they're just starting out. 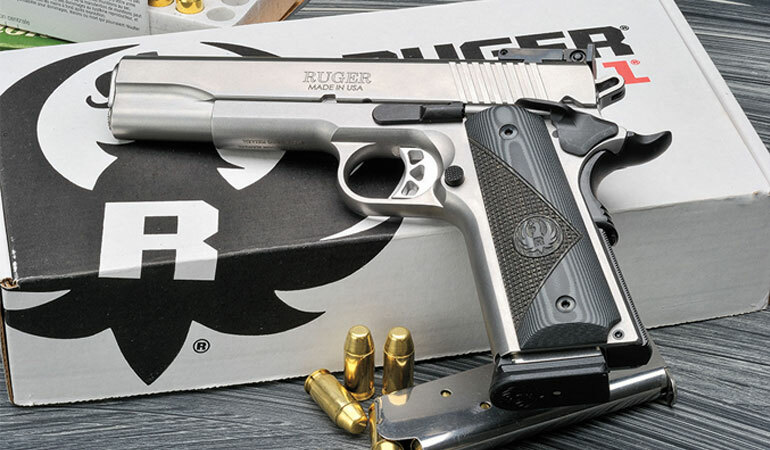 The Ruger SR1911 Target offers many of the desired features serious shooters desire, at an honest price.